It was a glorious Miami Music Week for The Chainsmokers, who took to the Ultra Main Stage on Saturday night for a middle-finger-in-the-air headlining set. Riding their high from Ultra 20 into Sunday, Alex and Drew provided Miami-goers with a Music Week closing performance at Story nightclub on March 25. The bass-turned-pop duo returned to their roots this weekend; showcasing some new music and encompassing dubstep, trap, and bass. Alex Pall & Drew Taggart are the dynamic duo better known as The Chainsmokers. Chart-topping radio hits, world tours and headlining festival performances have become the norm for these superstar DJs. 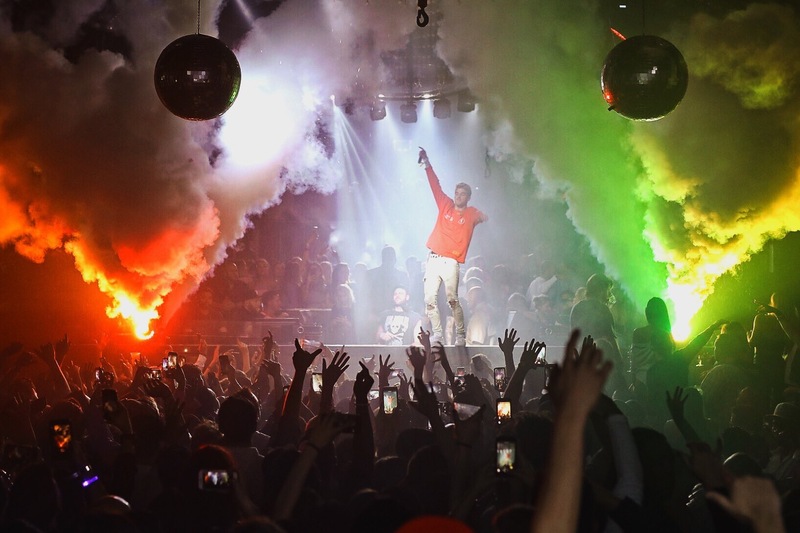 After closing out the Main Stage at Ultra Music Festival the night prior, The Chainsmokers took their show to the South Beach hotspot Story to officially shutdown the weekend in style. Highlighting the biggest week in dance music, Story nightclub showcased a stellar artist roster for Miami Music Week including Marshmello, Black Coffee, Marco Carola & Nic Fanciulli – and a grand finale from The Chainsmokers on Sunday night, March 25. Joined by a squad of support acts, The Chainsmokers were aided by Shaun Frank, The Him, Justin Caruso and Nick Martin to set the tone. Kicking off their energetic ensemble just before 2 am, Alex & Drew went on to play about two hours of their own originals, popular dance classics as well as throwing in some rap and rock favorites spanning across the past few decades. Drew was on the mic early and often whether it was singing live or just hyping up the crowd while dancing on top of the booth. Playing a bass heavy set at both Story and at Ultra Music Festival, The Chainsmokers, the GRAMMY Award-winning artists, threw down in Miami. Special guests Matt McGuire lit his drum sticks on fire for his flame infused drum solo and Halsey & Drew performed “Closer” live, adding to the Main Stage madness on Saturday. Starting things off from the production booth in the middle of the sold-out Ultra crowd, as their set began with a “Sick Boy” intro, Drew was seen running from the center with a red flare in hand until reaching Alex at the stage for the start of what was to be one of their heaviest sets in a while. In all honesty, The Chainsmokers won Miami Music Week with a big middle finger up to the haters.